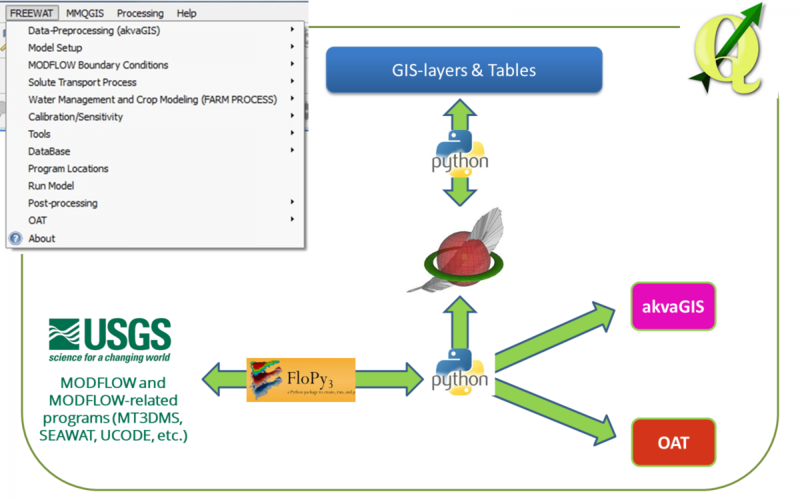 The FREEWAT platform is a large plugin integrated into the QGIS GIS desktop (http://qgis.org). At present, the FREEWAT plugin can be installed on Windows and Linux OS. Mac Users need a Windows/Linux virtual machine to run it on their own laptop. FREEWAT includes several modules for dealing with water management issues, with particular attention to groundwater. Simulation codes (mainly from the MODFLOW USGS family) for dealing with groundwater-related processes (e.g., groundwater flow, solute transport in aquifers, etc.) constitute the basis of the plugin. Sensitivity analysis and calibration (based on UCODE_2014). The following diagram shows how these different modules are interconnected, taking as reference a standard modeling procedure. dedicated tools for post-processing of model results. The way of interconnecting such tools is done via Python programming language, with extensive use of the Python library FloPy. A schematic representation of FREEWAT pillars and their interconnection is showed in the following figure. 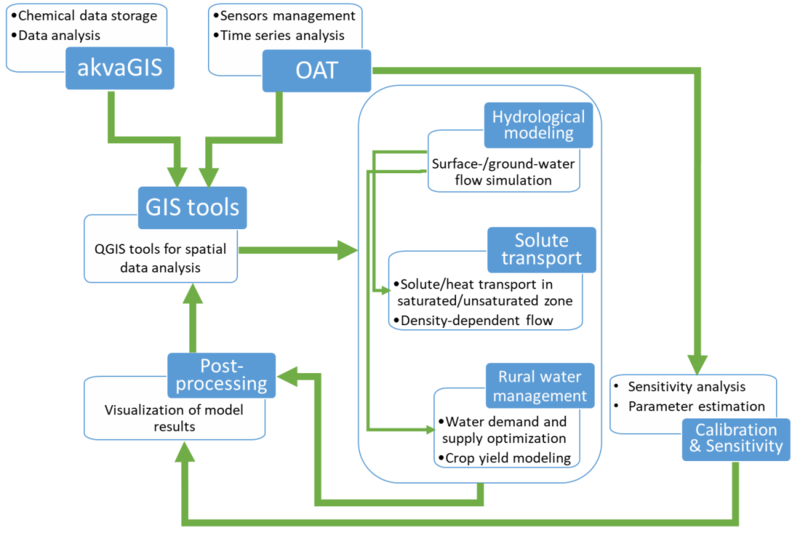 The main features of FREEWAT capabilities are illustrated in the table below, detailing the relationship between the components of the platform and the needs/priorities for ICT tools in water management, as suggested by the stakeholders interviewed during an initial survey.